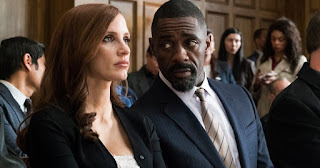 My first "new" movie of the year seen in a theater was MOLLY'S GAME (2017), directed by Aaron Sorkin. While Sorkin is known for writing both TV (THE WEST WING) and feature films (THE AMERICAN PRESIDENT, THE SOCIAL NETWORK), MOLLY'S GAME is his first directing effort. He also cowrote the script with Molly Bloom, who's portrayed in the film by Jessica Chastain (MISS SLOANE). 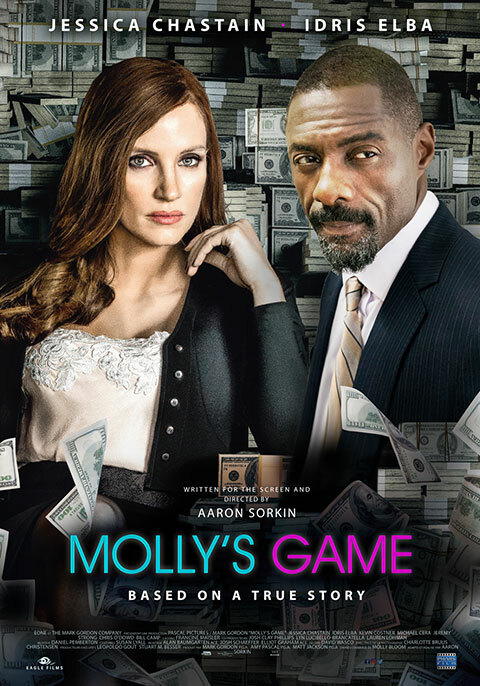 MOLLY'S GAME is the story of a very smart young woman with Daddy issues who ends up spending years running illegal high-stakes poker games for actors, business tycoons, European nobility, and ultimately (and very unfortunately) the Russian Mafia. After she's arrested by the FBI, defense attorney Charlie Jaffey (Idris Elba, Heimdall in THOR: RAGNAROK) learns Molly's story and tries to work out the best legal deal possible. That's pretty much the extent of the plot, though that bare-bones description doesn't capture how interesting it is, mostly due to Chastain's extremely compelling screen presence as well as the unusual subject matter and storytelling style, with Chastain's Molly offering ongoing voiceover commentary on her life. The movie ran a bit too long at 2 hours and 20 minutes but I enjoyed it all the way through. That said, as the movie came to an end I couldn't help wondering what the point of it was. It's an engrossing story, well told, yet neither Molly or the audience really learns much from her experiences; indeed, Molly's future is an open-ended question as the the final credits begin to roll. There's a lot of waste in Molly's life; as her father (Kevin Costner) correctly points out, with her smarts if she had gone to law school she would have had her own firm by the point in her life where she ran into legal trouble. Or she could have put her brains to use in any number of other areas and been a success. Near the end of the movie her father analyzes how she went from Olympic-class skier to being charged with a felony, but where does she go from here? And do we care? Chastain is fascinating in the role yet not especially sympathetic, especially as Molly begins a downward spiral and starts using drugs to keep up with her lifestyle. (Chastain looks increasingly haggard and harshly made up as time passes, which is effective.) When she's riding high she has a lot of money for a fancy wardrobe but not much else, including no friends; as her attorney points out, even the people she's protected by keeping their names confidential aren't there to back her when it counts. Ultimately, if one looks beyond the glossy trappings, it's a tragic story on multiple levels. I agree with varied takes on the movie by a pair of critics I respect: Justin Chang of the Los Angeles Times sees the film as a "thriller of the mind" which is a "blast," while Leonard Maltin writes that "Because its characters are cold it’s...difficult to maintain empathy for Molly as she climbs out onto a dangerous limb." I agree with both points of view. It's an enjoyable film which is well worth seeing, but in the end a viewer might well ask "Is that all there is?" 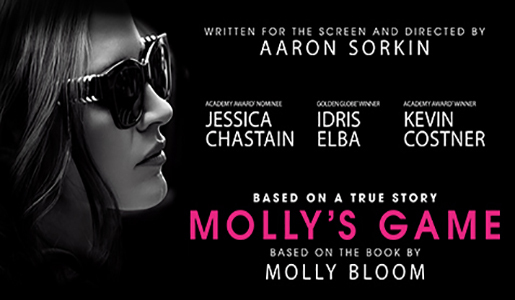 Parental Advisory: MOLLY'S GAME is rated R for foul language, drug use, and some violence. It's a fairly mild R as these things go, but it's not a movie for children, especially as there isn't really any positive takeaway when it's all said and done. A trailer is on YouTube. I'll be giving my MoviePass card quite a workout over the next couple of weeks as there are several new films I'm interested in seeing. Stay tuned for additional reviews of new releases along with classic film DVDs and Blu-rays!